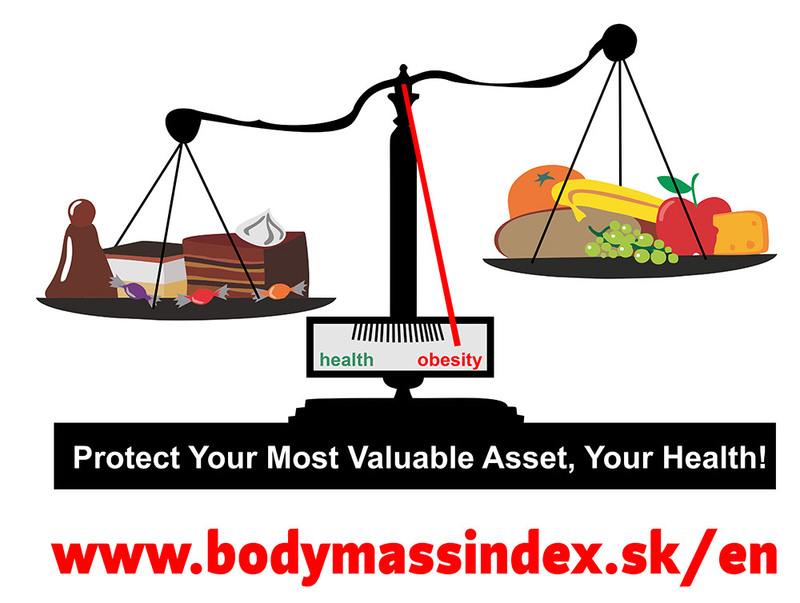 The Body Mass Index (BMI) has long been used as a quick method of making body composition. It is often associated with an assessment of obesity. This calculation is a good guideline for the average person. BMI does not take into account the composition of the human body, the somatotype, the amount of muscle and fat in the body. Therefore, the calculation of the body value index is only an approximate number. Because it is a mechanical conversion, the Body Mass Index is not and can not be accurate. The body weight index is calculated as weight in kilograms divided by the second square of height in meters. The easiest way to calculate it on the Internet if you enter your data in your BMI calculator and you will get the answer by return. Or, you can quickly browse this table and find your results. In this table I rounded the numbers. Mathematicians can tear all their hair at a time, gradually, or to each other because it should be written, for example, 19.9 – 24.9 and I rounded it. So do not worry. BMI – less than 19 = underweight. Underweight is very dangerous for health. If the BMI Calculator calculates a low figure, you have to deal with it quickly, preferably with your doctor. Underweight is far more dangerous to health than obesity. BMI 20-25 = Good result. In this area, you should try to keep your numbers. However, please read the comment on normal weight. BMI – more than 30 – 35 = first-degree obesity. If you fall into this category, start changing your lifestyle immediately. Learn how to lose weight as soon as possible. Otherwise, you risk your health. BMI – more than 35 – 40 = second-degree obesity. BMI – more than 40 = third-degree obesity. Comment on normal BMI: The result of the normal Body Mass Index is now to be described a little in more detail. The younger you are, the lower you should be within the normal BMI. A 20-year-old man who has a BMI of about 20 is probably very good. On the contrary, the pensioner should be about 25. Ideally, you should have an active lifestyle and your body should be relatively muscular. No, you do not have to do bodybuilding. Just try to make BMI higher with your shoulders and thighs. Not because of your big stomach! On large population samples, it has been shown that it is preferable for health to move above the standard, as in the lower. This means it is better to have BMI 24 and worse to have 21. This statistic is not quite accurate. But it turns out that having a little more reserve fat is good for health. No, it does not mean you have to suffer overweight or even obesity. However, in the elderly, the paradox is that the youngest has a higher risk of death. This means that while you have a fairly regular BMI, it is good if you have a slightly higher percentage of fat in the body than you would like. It is optimal to have a little more weight compared to the ideal weight, thanks to the actively built muscle and peacefully a few extra kilos of extra fat. Especially do not try to stick to extreme slenderness. She is not healthy. I understand that athletes need to be light. The difference is whether to run 80 kilos or 74 kilos. If the athlete goes to some 3% of the fat in the body, he will give better performance to the competition. However, no one is dealing with whether it is healthy (usually not) and whether it is sustainable (it is not usually). Against the concept that health is optimal to maintain your body weight index somewhere at the top of the standard is another claim. It turns out that health is optimal if your energy intake is much less than it should normally be. The accuracy of the Body Weight Index is a bit of a problem. At the entrance, we have only the height and weight of the body. This brings several serious problems. The calculation does not take into account the somatotype. A person who is naturally coarse, but not obese, get a wrong result. BMI is not set for people who are not average. Athletes have erroneous results and the obese person may have falsely distorted numbers. While you have a body in a certain statistical rule, you calculate a relatively usable number. But who is considered to be someone in the statistics? We’re all different. Therefore, the Body Mass Index should only be taken as a help number. Something tells you, but you do not know everything. Even in this way, the results cannot be checked continuously. If you start to lose weight and exercise at the same time, it may happen that BMI will go down lower than your real problem – intragastric fat. In this figure, you can see an example of when two people can weigh roughly the same 130 pounds. If they have the same height and weight, they will have the same BMI. Thus, the body weight index will both be in red numbers as heavier obesity. world champion in switching channels on the TV. Guess which one is smoother, healthier, more vivid. 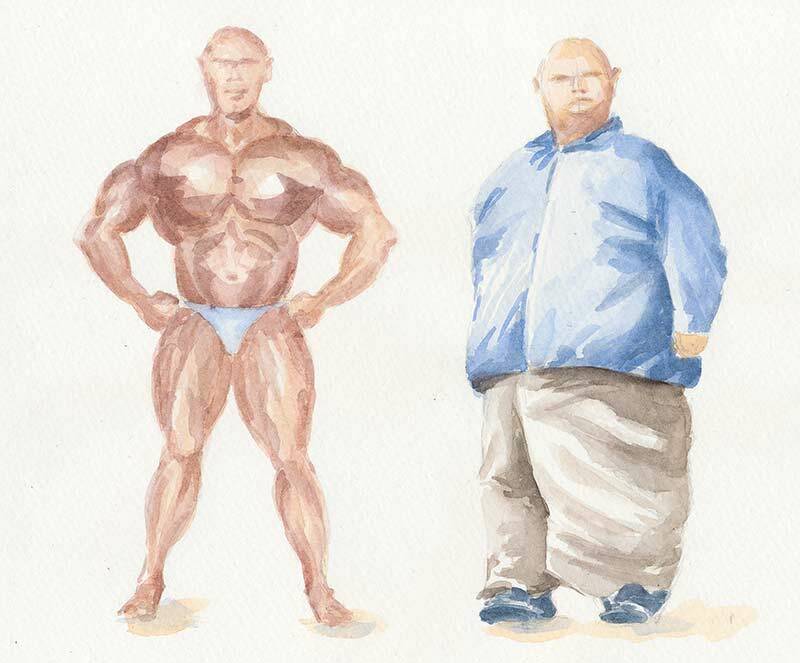 Let’s look in more detail now to compare the athlete and the obese. Especially in the light of how it affects the Body Weight Index. First of all, let us first focus on healthy people. The more intense and regular you are, the less it is common today. So you’re not in the norm. A sportsman usually has a different body composition than an armchair (homo armchairus). The Athlete has a larger volume of active mass. It is muscle, bone mass and even more blood in circulation. These physical components are relatively difficult. More muscles = plus weight. You do not have to see that you are some beaters but you are already wearing the active body mass. This will be signed on your body weight index. If you are sporting, you do not have much fat in your body. Many athletes have about 3 to 5 percent body fat. As opposed to the ordinary population, they are not used to lean. This is something that sportsmen are so slightly out of line. When calculating BMI, it is assumed that normally 15 to 20 percent body fat is present. The athlete will therefore have a fake high score. Although his body parameters are normal and overflow with health, the result of the calculation will mistakenly warn him of obesity. If someone is nice and slow to get around, he is a candidate for fairly accurate BMI calculations. Whatever its obesity is, it will probably be close to the average population. They practice only recreationally, or rather at all. But here comes the second possible distortion of the results, and that’s a diet! Hands on the heart – a lot of obese people are trying to lose weight in their lifetime. These are mostly hunger and diet attempts. Let’s look at what’s happening in the body if you eat a diet. The body is alert because it records malnutrition. He will quickly start the rescue. It slows down the metabolism to more economical. It starts to save energy, produce less heat. It reduces the willingness to move so that it passes as little as possible. If hunger does not stop, the body begins to disassemble its proteins. Just after a bit, but it necessarily needs them for regeneration. In other words, this means that muscle and bone mass is gradually degraded during diet and fasting. To be able to imagine it, just look at real examples. You do not have to believe what I’m writing here. Look at the web for what looks like women who are malnourished. Extremely slim models or women suffering from long-term eating disorders. If you look at building their bodies, you will see a lot of differences compared to people who have never quenched and gone. For example, an extremely lean muscle over the elbows, very slim wrists or hips. That’s exactly what the muscles look like, which the body had to turn itself on to survive at all. Another thing (but not to see) is the bone mass. Higher age is due to a high risk of breakage. How does it affect BMI? Essential! We have already said that muscle is much heavier than fat. That’s exactly what’s going on. An obese person after hunger will be much lighter on weight because he has lost active mass. This, however, can deceive the outcome of BMI. After a diet, they feel excited and slowly return to normal life. She starts eating normal food, and in three months she realize shes got 90 pounds. What happened? 3 kilos of water was returned. She took 9 pounds of fat. As she did not practice, nothing happened to her muscles. Now it has 2 kilos less muscle and 2 kilos more fat. And the BMI has the same weight as before! Quickly! Another diet, because the previous one did not work. So now you can make a low-carbohydrate diet. And the situation is repeated. At the beginning of the diet, it sinks from 3 kilos of water, taking the diet very tightly and losing 2 kilos of muscle. Let’s be realistic. She gets her 90 pounds for a quarter of a year after her diet. But it already has 11 kilos of fat plus minus 4 kilos of active matter. A BMI? It’s still like the first diet. 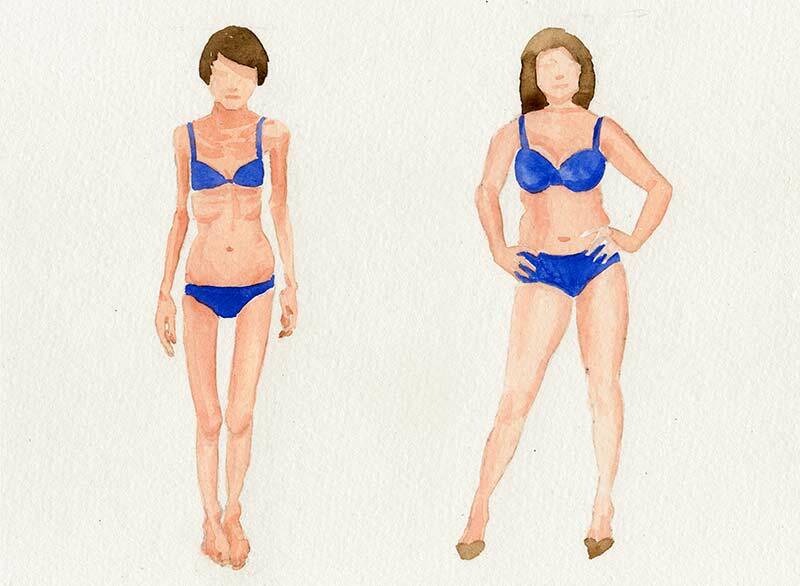 Therefore, the body mass index does not change, but the woman gradually becomes fatter. Therefore, after several diets, an obese person can also measure normal BMI! Do you want to avoid fake data? Before you lose weight, measure the belt. As the waistline decreases, you lose fat. Even if weight or BMI showed the same number. During healthy weight loss, the active substance was built up and the body was stripped of fat. After a loss, one stops being careful, stops practising regularly and eating healthy. In the course of weeks, it loses muscle and starts to return fat again. It does not have to show up for a long time. Neborák has a false sense of „aha, I can sometimes choke and still the same weight“. The belly grows. Those who measure the belt would see it. The BMI itself does not reveal this phenomenon. Therefore, BMI is a relatively risky parameter that often fails to identify the most important parameters. In this figure, you can see a comparison of what happens if you focus on food and other inappropriate foods. You can not redo a healthy lifestyle by dieting by BMI or in restaurants. You need to start eating regular healthy meals and exercise more. At younger age, there is a great prevalence of slim women and obese men. It can be easy to comment on – women care more and try. A young man often does not realize he is wrong. At 45-54, the proportion of obese men and women is almost the same (23% of men and women of middle age are obese, which is almost a quarter of the population). Men do not have to try their best, but the women will get them first after birth, and then they will stop taking care of other duties. From the age of 55, men and obese women are overweight, but this can also say that obese men are rapidly dying at this age because if they are not asleep, many will die of the consequences of various chronic metabolic diseases. Only 38% of Slovaks have the optimal body weight. Overweight has 36% of Slovaks. 26% of Slovaks suffer from obesity. In other words: 62% of Slovaks are more fat than they should be. Nearly 10% of all children have a risk of body mass index (BMI around 26), overweight was found at 4.5% and obesity in 6% of children. From maintaining optimum weight and therefore BMI, the ideal sleep time is about 7-8 hours. People who sleep less are usually more skilful. The leptin concentration decreases (leptin acts anorexigenously, so it suppresses appetite. By combining excess gluten and leptin deficiency, apathy increases and the inexperienced person is much more involved. A cortisol secretion disorder contributes to insulin resistance and glucose tolerance failure. These are the components that are related to the development of metabolic syndrome. The sympathetic activity increases. This contributes to hypertension, i.e. an increase in blood pressure. At the same time, it often signals that the body is so „full“ and can not rest. Sleep deficiency can cause a tendency to hypoglycaemia. Hypoglycemia is a condition in which, among other things, consciousness is a little distorted. Man is less controlled and tends to eat more. Preferably sweets. The longer you watch, the more time you have to be able to defeat. Therefore, do not underestimate sleep. Women who sleep less than 5 hours a day have a 2-fold risk of developing obesity. Men sleeping less than 5 hours a day have a risk of obesity up to 4 times. In children, shorter sleep is associated with higher BMI and risk of obesity. So it’s strange, but if you want to keep your Body Mass Index within what kind of standards, so you need to sleep well. Make sure you eat regularly. 3 times a day give you the right food and nothing between it. No crackers. If you do not manage it or are still hungry, add ten and lead. The amount of food should correspond to your height, age and body load. Prefer a diet that is at least a long way to feed people a few decades ago. Eat lots of legumes, acidic cabbage, vegetables. Prefer to eat a low-fat meal. Minimum meat and dairy products. These measures optimize energy intake. But this is the move. Man is not designed for passivity. Beware of a sedentary way of life. There is not much to write about this. Movement decides whether you will be vital or cumbersome. It is known that cardiorespiratory fitness determines what risks you are threatening. In English, this means that if you have heart and lungs, you are likely to stay healthy. 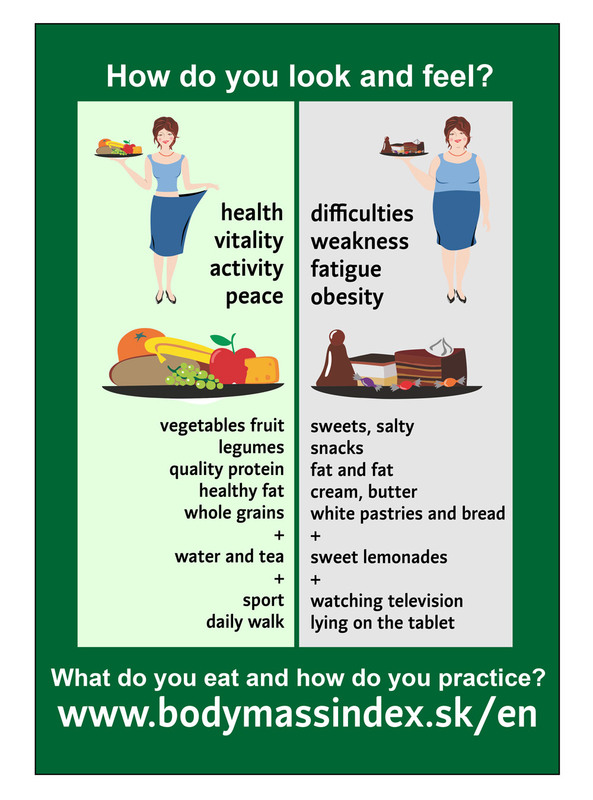 It is better if you have a slight overweight while practising. Worse if you are lean, but do not move. Go for at least (more than) 10,000 steps a day. It can be about 5 kilometres. It is useful if you do it at such a pace that you can even breathe. Only then does the right training for the heart and the lung. If you can change activities and load over time, it is ideal. But it’s always true: start a little bit. It is not a goal to destroy. To make a positive move, expect to sacrifice about 6 hours a week. It is no longer effective. Well do not miss it! More than 12 hours of walking a week is also not good. This also applies to other sports, with fewer numbers. Running or training should be 3 to 6 hours a week. No less, not much more. Otherwise, you will not be prosecuted for regeneration. You have to make sports in life even about your work and your personal life. If you train long at work, it starts to be harmful to health. There are already problems in the game because the excessive dosage of sports becomes stress. And stress is the next ingredient in the jigsaw puzzle, as the Body Mass Index can hold on to healthy numbers. Under stress, imagine the burden. It does not matter if you are out of work, too hard training or financial worries! Everything is burdened by your body because under stress there are things that prevent depression and encourage recruitment. So, if your body weight index suspects, the cause may be stress. In stress, various substances are excluded from the body, which is designed to prepare for combat or escape. If you are stressed by work, worries, struggle or escape you can not deploy. You do not have to walk away. (The only thing you could do is to practice). Their long-term activity in the body is harmful and leads to recruitment. Stress automatically stops digestion. Disorders of digestion are a sign of the body that it should store reserves because there is a state of danger. Even intestinal microflora with digestive problems can be disturbed. It can be easier to start and take. Stress = exhaustion. The exhausted person significantly falls into the bar and falls away from it. Also, fatigue is also a great excuse to practice. Well, and especially in the state of exhaustion, you have not even the power to fulfil the preposition. There are many other reasons why stress is one of the greatest health destroyers. Do not see why everything is bad, but solve how you avoid it. Look for ways to regenerate and your body weight index gets to normal numbers. Do not let stress become part of your life. The proportion of body fat increases with increasing age. The peak reaches between 60 and 75. Year of life. The visceral (intracerebral) fat is increased and the proportion of subcutaneous fat decreases. In addition, the fat in the elderly gradually gets into the muscles. As we have already pointed out: Even if BMI does not change, these changes are associated with ageing. The number of people who have a waist circumference grows bigger than they should be. BMI tends to grow slightly over the course of its life. Increases in BMI include weight loss with age, atrophy (wasting) of muscles, i.e. worsening of active mass and growth of fatty tissue. In people aged between 60 and 80 years, the BMI interpretation is not accurate. The ideal BMI is older in older people than in younger age groups. And highest with BMI less than 23.6. 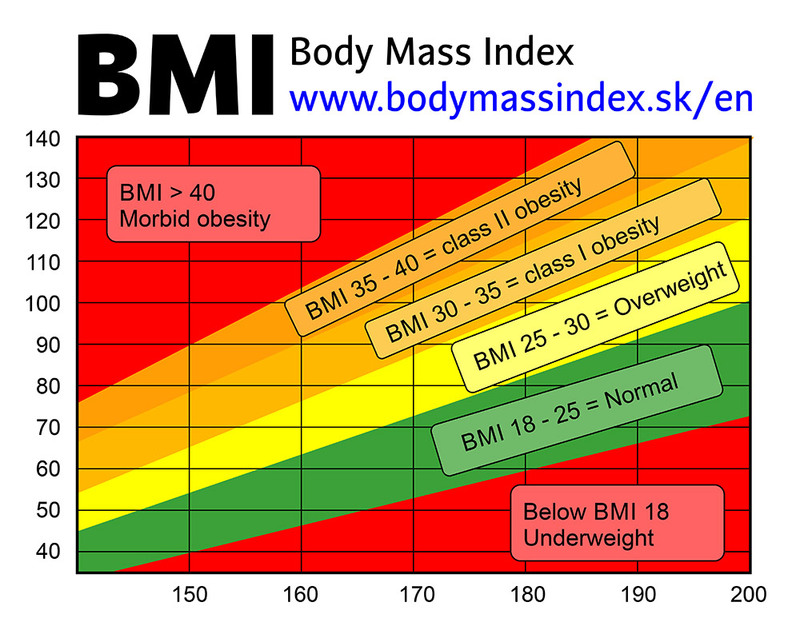 Therefore, BMI 25-30 is considered an ideal body mass index in old age. One of the important reasons why you have optimal weight and BMI is old age. Just notice the older people who are walking around the city every day. Many are morbidly obese. Especially older women will see how they are tired of sticking and sticking 50 kilos of bacon as a supply. A similar battery of medication costs the senior a lot of money. In the course of healthy lifestyles, many of these drugs can be either completely discontinued or significantly reduced in dosage. Also, high BMI in the older age is also severely aggravating seniority. He does not get to some places in the body and needs assistance. Often, the problems are just a snarl. Or injuries even when doing normal work. Worse still is if an obese senior needs medical help. Some diagnostic tools (such as CT) are not designed for obese. A fat man will not get into them. Many surgical procedures are tied to the use of special positioning tables. But these tables do not have a capacity of 150 kilos. Then the procedure is not possible. Injuries, post-operative conditions, and many diseases are much worse for healing and healing if a person is in poor physical condition. Even from this flight calculation, you can see that obesity and high BMI in older age can dramatically reduce the quality of life and sometimes even shorten it. An accurate indicator of the amount of intragranular fat and total body fat is the waistline itself. Often these two results are very similar. If an individual decides to lose weight, he usually begins to lose in-fat fat. As poor as his BMI is falling. The waist circumference for men and 94 cm and women and 80 cm increase the risk of various diseases and metabolic complications. For central obesity (for the big English belly) the waist circumference is 94 cm for men and 80 cm for pregnant women. Lower borders for central obesity are designed for men in Asia and the Japanese, a little higher for Japanese women. Obesity causes a significant increase in morbidity, disability and mortality. It aggravates the quality of life. Significantly increases the risk of disease and death for many chronic noninfectious diseases. The most common are cardiovascular diseases, oncological diseases and diabetes mellitus. Finally, a small request. Do you consider this article to be useful? Please share it because it can also serve this information to your acquaintances. Maybe as a motivation. Let’s keep your BMI well in line.